U.S. President Barack Obama has never traveled to South America before, but the month of March will mark an uptick in Latin America-related meetings for him. On March 3, he hosts Mexican President Felipe Calderón at the White House. Then, from March 19 through 23, Obama heads to Brasilia to kick off a five-day trip that will also take him to Rio, Santiago, and San Salvador. AS/COA Online looks at the issues likely to be discussed when Obama meets with the presidents of Mexico, Brazil, Chile, and El Salvador. The rescue of the 33 miners trapped in a collapsed Chilean mine captured the world’s attention this week in ongoing and emotional coverage of the 22-hour operation. AS/COA Online offers an overview of official coverage, exceptional graphic and multimedia reports, and news about what comes next for those rescued and Chile’s mining industry. U.S. Secretary of State Hillary Clinton tours Latin America this week for a journey that takes her through the Southern Cone, Brazil, and Central America. Though hers is a trip through the Americas, it involves Middle East policy. “I’m on my way to Latin America next week. And Iran is at the top of my agenda,” said Clinton in February 24 testimony at a Senate Appropriation Committee, hinting at concern over Brazil’s deepening ties with Iran. 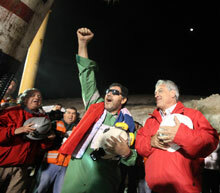 But that was before an 8.8-magnitude earthquake struck Chile, one of the stops on the secretary’s trip. Her trip runs from February 28 through March 5 and she travels to Uruguay, Argentina, Chile, Brazil, Costa Rica, and Guatemala. An 8.8-magnitude earthquake struck Chile on February 27. The disaster left thousands homeless and wreaked havoc on infrastructure while setting off tsunami warnings in dozens of Pacific countries. Sebastián Piñera won Chile’s second-round elections on January 17, marking the first loss by the Concertación coalition in two decades. The billionaire emerged as the clear victor by Sunday evening, pulling in nearly 52 percent of the vote in the race against former President Eduardo Frei.